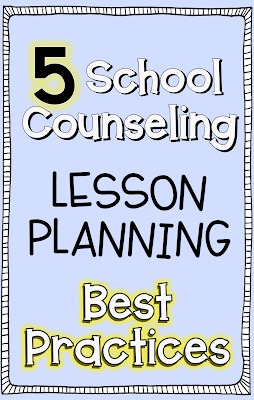 This post is part 3 in a series on school counseling core curriculum planning. You can read part 1 on the overall vision here and part 2 on needs assessments here. 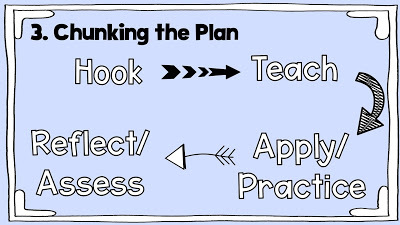 I’ve said it before and I’ll say it again – I’m particular about my lesson plans. Downright picky. In part, this is because I think the lesson you believe in is the one you’ll deliver the best. It’s also because I want lessons to be catered to my students. Because I’m picky about my lesson plans, I write almost all of them entirely myself. It’s been a bit of trial and error but I’m finally in the sweet spot of feeling like I know what I’m doing when I sit down to plan out a lesson. I’ve discovered some best practices that make this planning faster but also, more importantly, that lead to engaging and effective lessons. I want my lessons to flow well and be fun, but that’s not enough. They need to actually WORK! I’ve also realized that my lesson planning is well aligned with what the research says is best practice. As someone that’s easily excited by research and data and evidence-based practices, this was mega awesome! Research and peer-reviewed publications aren’t everyone’s jam though, so I’ll put those bits and pieces at the end of the post. Without further ado, my top 5 best practices in school counseling lesson planning. I’ve tried to link within to specific examples. 1. Ask yourself: What’s the objective of this lesson? 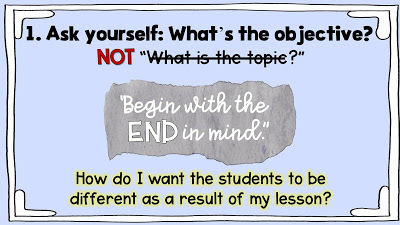 I’m not a 7 habits person, but Covey nailed it when he said “Begin with the end in mind.” It’s too easy to ask ourselves “What topic am I covering?” or “This looks like a cute book, how can I use it?” Ask yourself instead, “How do I want the students to be different as a result of my lesson?” Are there concepts you want them to be able to identify or compare? An attitude or belief you want them to develop? A specific skill you want them to learn and practice? Once you’ve nailed this down, the rest of the lesson will come more easily…and it will be more effective. I admit that I use to plan my lesson in scribbles on whatever paper is around and then actually write the plan later, after the fact. 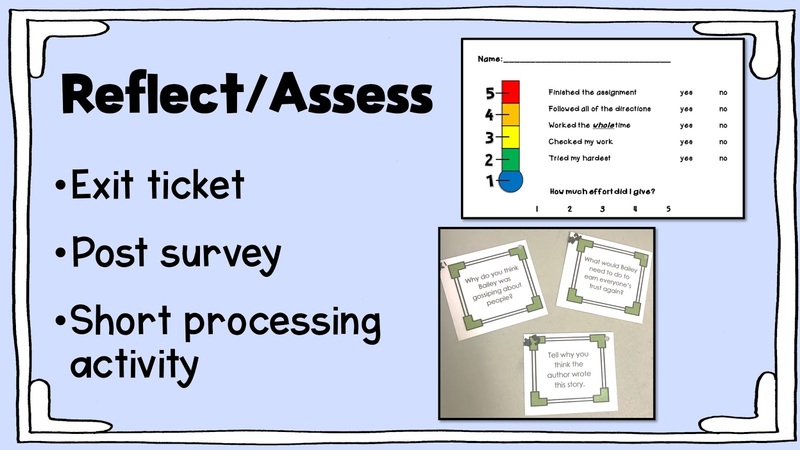 The quality of my lessons improved when I took the time to think through the lesson objectives from the start. 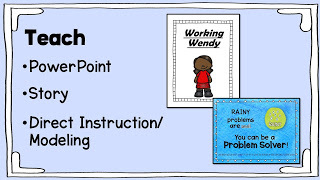 I rarely use worksheets in my classroom lessons. 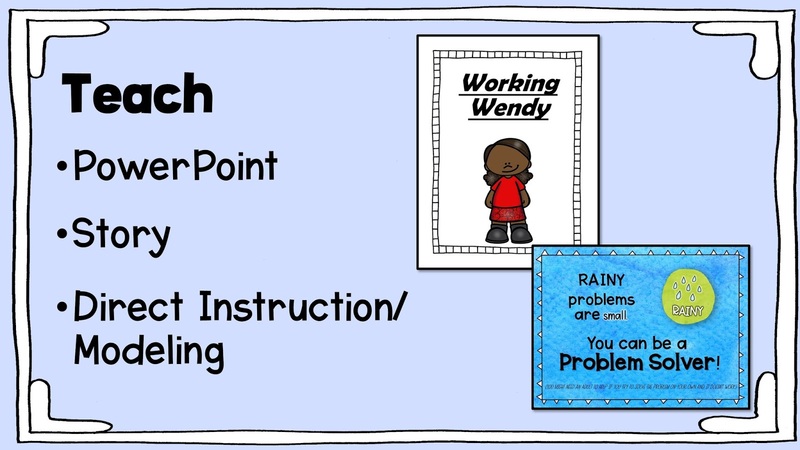 The next post in this series will be all about this idea so I’ll save some details for later; I just encourage you to consider ditching the worksheets and coloring sheets, or at least use them more selectively. There’s much cooler and engaging things you can do that will result in deeper learning and growth. Save some trees. Ask yourself this: When’s the last time someone’s attitude, beliefs, or behavior changed because they completed a worksheet? Each lesson I do, whether it’s 30 minutes in kindergarten or 45 minutes with my 4th graders, is chunked into three or four parts. One reason is due to my students’ short attention spans – I’ll lose them if I try and do the same thing with them for too long. Another reason is that different components connect with different students and with different parts of their heart and mind. My lessons all include three or more of the following: hook , teach, apply/practice, and reflect/assess. 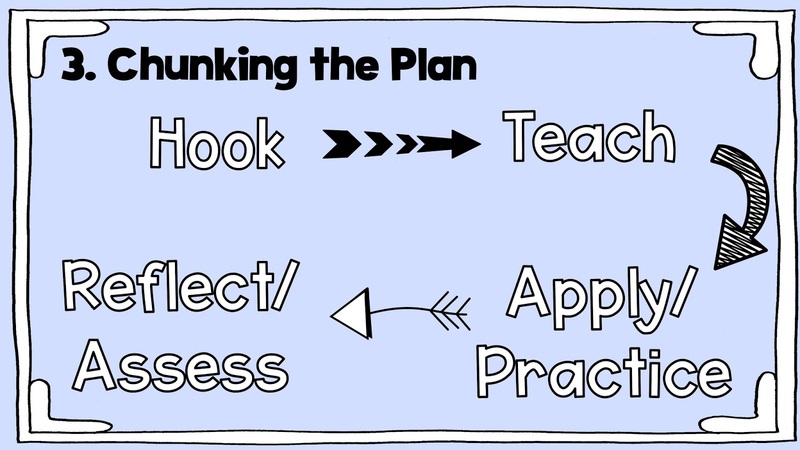 The hook is where I get the students interested and prime them for what we’re doing to be talking about. Sometimes it’s a story (a book, a personal story of mine, etc. 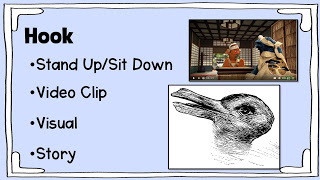 ), picture, or video clip. Other times it’s a stand up/sit down to help them realize that the issue we’re talking about effects them. The same things used for the hook might also teach; this is especially true for Julia Cook and Trudy Ludwig books and Sesame Street videos. Other times, there needs to be a separate and explicit teaching component. It can be as intensive as a PowerPoint or as simple as me modeling a skill. The apply/practice component is the most important; this is the meat of the lesson! Students get a chance to put their learning into action. 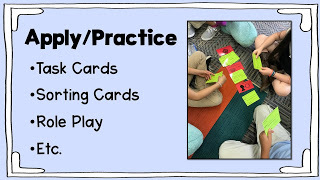 There’s tons of activities you can do with task cards or sorting cards for this. Role plays are another great option. I’ll talk more in a different post about some of my favorite “go to” activities for any topic. 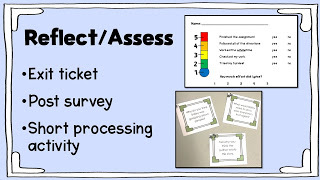 And last but not least, I like to plan for a short reflection or assessment activity at the end of a lesson. Most often this looks like a short exit ticket with a question for them to reflect on the lesson in some way and that also lets me get a sense of what they gained from the lesson. Occasionally I’ll do a couple questions with right/wrong answers. Sometimes we just gather together and process through some of the specific examples or scenarios from our activity. If we run out of time and don’t get to this part of the lesson, no biggie. I always plan for it though. 4. Get them working together. Even when the lesson isn’t explicitly about a specific social skill, it just about always involves students working and learning together. It’s good instructional practice, it helps develop communication skills (extra important because of our large ELL population), and they always get the opportunity to practice some healthy conflict resolution. I also love peer collaboration because it allows me to incorporate more “challenging” (emotionally or academically) tasks and activities than if students were working independently. My reputations lesson is an example of a lesson that wasn’t explicitly about a social skill but involved two different activities that required lots of student interaction. This probably isn’t mind blowing to anyone; we all know kids need movement, more movement than is typically part of our crazy academic school day schedules. 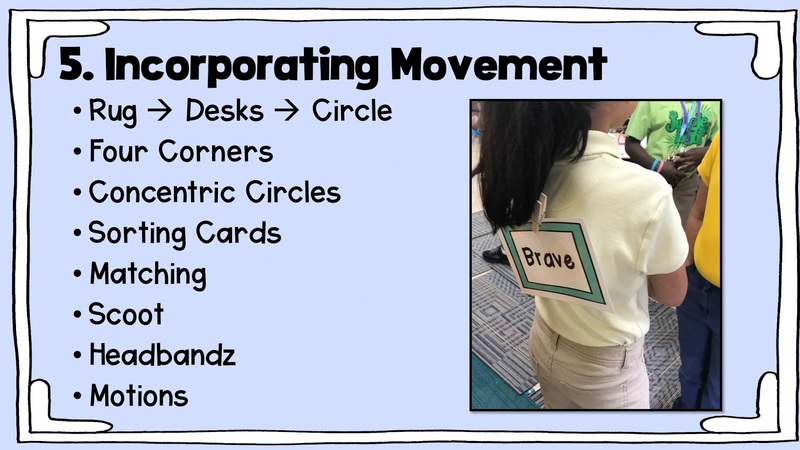 While including movement in my lessons often adds an extra layer of work for me (planning use of space in different classrooms, modeling appropriate movement, etc. 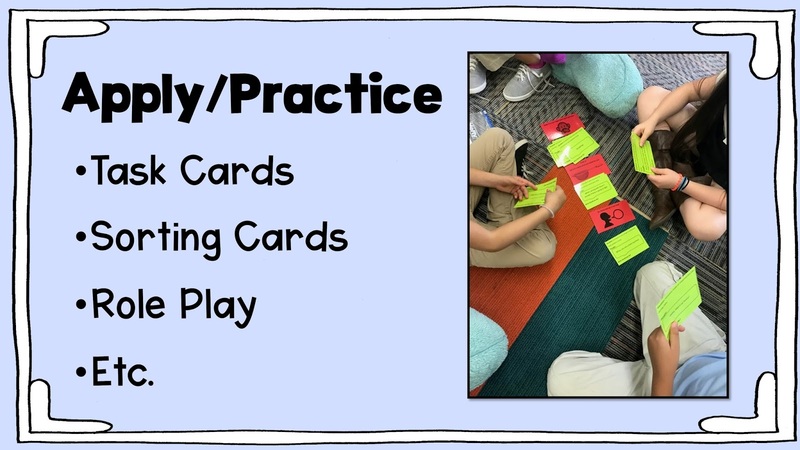 ), the lesson usually has a better flow if I let them move and it connects with their kinesthetic learning side (which everyone has). 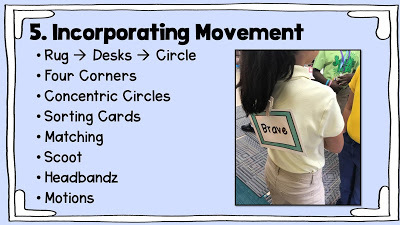 You can see in the graphic above some of the ways I put movement into a lesson. Sometimes it’s as simple as doing different chunks of the lesson in different parts/arrangements of the room and moving in between them (and sometimes moving in fun ways: “waddle like a penguin back to your desks”). Other times, movement is a core part of the activities like in scoot or quiz-quiz-trade. 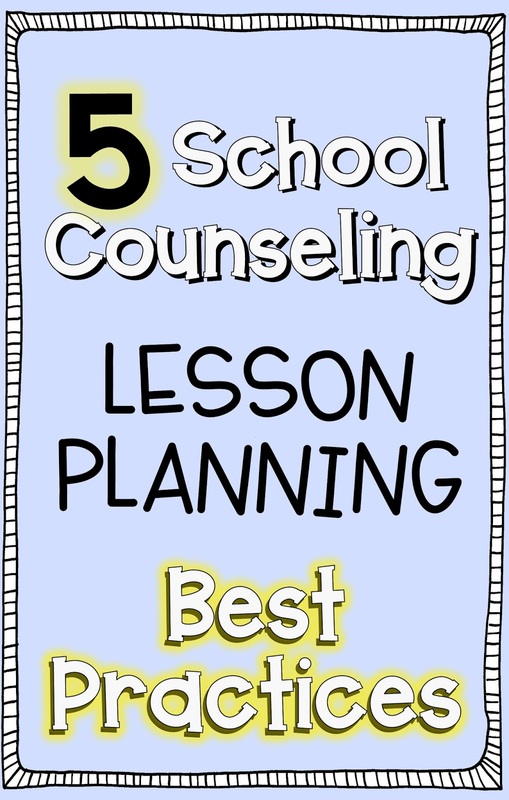 Truth be told, while the research on effective comprehensive school counseling programs is growing, there’s not much on effective school counseling lessons. 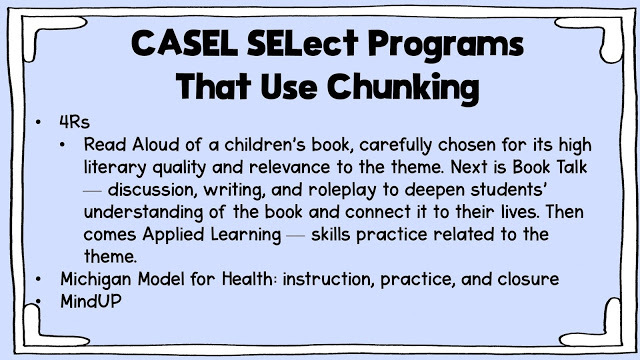 Much of the research I found came from looking on the CASEL (Collaborative for Academic, Social, and Emotional Learning) website and finding useful articles about social emotional learning in general or on commonalities between evidence-based canned programs. 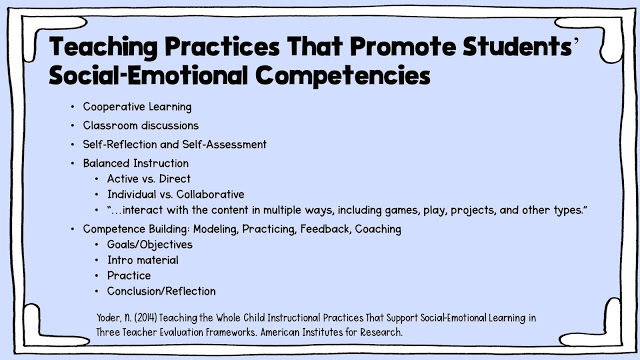 When I presented on this last fall, some of my slides covered the research backing these strategies. I’m going to go ahead and just put those slides in here instead of re-typing them because…I’ve got a lesson I need to go finish planning!